"Archaeologists have unearthed long-lost art from a civilization that once inhabited the Caribbean." Source: IFLScience (2017). "Known as the Tainos, these people once lived on the island of Mona, Puerto Rico – now an uninhabited nature reserve – in the 14th century, before the arrival of Columbus. Now gone, thousands of pieces of Taino art have since been found in caves on the island, offering a fascinating glimpse into their culture." This Wikipedia entry is kind of confusing. It makes it sound like the Taino and Tainos were two different tribes. I'm guessing, though, that there were two different waves of migration by the same group of people. The Taino are thought to have come from South America -- the Amazon basin, perhaps, or the Columbian Andes. "Researchers have long thought that snail and clam shells found at Caribbean archaeological sites were evidence of 'starvation food' eaten in times when other resources were lacking. Now, a study suggests these shells may be evidence of children helping with the grocery shopping -- AD 400 style." Source: Science Daily. "Coso Rock Art District, containing the Big and Little Petroglyph Canyons, is a rock art site containing over 100,000 Paleo-Indian and/or Native American Petroglyphs." Source: Wikipedia. According to The Bradshaw Foundation, "The Coso petroglyphs consist of rock carvings depicting animals, abstract symbols and anthropomorphic figures ... The petroglyphs were created by pecking, grinding, or scratching into a rock's surface. They have been dated between 10,000 and 1,000 years old, based on associated archaeological evidence such as the remains of dwellings, hearths, or flaked stone artifacts such as obsidian arrowheads." "No one knows for sure who decorated Little Petroglyph Canyon with images out of a dreamscape, some thought to be more than 10,000 years old. Or why the basalt walls of a narrow wash in the bone-dry Coso Mountains at the northern edge of the Mojave Desert became a magic canvas for flocks of bighorn sheep, hunters with bows and arrows poised and more. But the area is probably the richest Amerindian Petroglyph / rock-art site in the Western hemisphere." (Wikipedia). "Eleven archeological sites, occupied during the time period A.D. 500-1100, were located within the boundaries of White Tank Mountain Regional Park. All of these sites can be attributed to the Hohokam Indians . The White Tanks were apparently abandoned by the Hohokam about A.D. 1100. There is no further indication of human occupation until the historic period, when the Western Yavapai controlled the area." Source: Maricopa County Parks & Recreation. "... 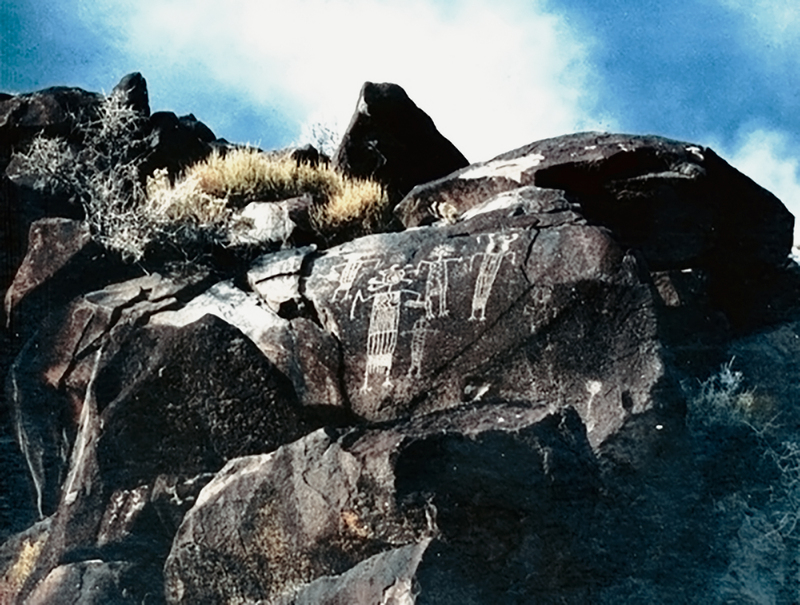 Ancient Arizonans pecked hundreds of figures and symbols on the rock faces of the White Tank Mountains. Some may approach 10,000 years old. All have withstood sun, rain, and vandals for 700 or 800 years or more." Next video (2013) discusses Hohokam irrigation techniques. "A new high-tech analysis shows the oldest known petroglyphs in North America, which are cut into several boulders in western Nevada, date to at least 10,500 years ago and perhaps even as far back as 14,800 years ago." Source: Science Daily (2013). "The petroglyphs located at the Winnemucca Lake petroglyph site 35 miles northeast of Reno consist of large, deeply carved grooves and dots forming complex designs on several large limestone boulders that have been known about for decades..."
Video from 2015. Bronze Age burial site. Southeast England. There are dozens of different types of ancient burials. During some periods, various cultures buried their dead in the ground (inhumation), sometimes reusing old grave sites (secondary burials). In some cases, the dead were buried, left to decay, then dug up again and their bones reburied elsewhere in bundles. Other cultures sometimes bundled or wrapped their dead for burial before rigor mortis had set in, and the ancient Egyptians famously mummified their dead (or some of them, anyway). It was also very common for bodies to be cremated with their ashes interred in urns. And in some places the intact corpses were buried whole in urns. Some cultures exposed bodies to the elements in platform burials. Platform burials are a form of excarnation or defleshing, a gruesome method for reducing a body to bones by leaving it exposed to the elements or wild animals or by butchering the carcass. Excarnation was apparently common enough that archaeologists have had to develop methods to tell the difference between remains that were defleshed for funerary purposes and those that were butchered by cannibals. Sky burial, a form of excarnation, is still practiced in "the Chinese provinces and autonomous regions of Tibet, Qinghai, Sichuan and Inner Mongolia, as well as in Mongolia, Bhutan, Nepal, and parts of India such as Sikkim and Zanskar." Source: Video description. The Ancient History Encyclopedia has a detailed article on ancient burial practices and there are lots of resources on YouTube. Also see: The Most Fascinating Ancient Burial Rituals. "A Neanderthal skeleton first unearthed in a cave in southwestern France over a century ago was intentionally buried, according to a new 13-year reanalysis of the site." Source: National Geographic (2013). "Confirming that careful burials existed among early humans at least 50,000 years ago, the companions of the Neanderthal took great care to dig him a grave and protect his body from scavengers, report the study authors in the Proceedings of the National Academy of Sciences. According to this study, the find "serves to establish the existence of intentional Neandertal inhumation in the European Middle Paleolithic." I'm a huge fan of the original Conan stories by Robert E. Howard, one of the best American writers who ever lived. I like the movies starring Arnold Schwarzenegger as well, even the second one which is almost universally considered, with considerable justification, to be a piece of crap. The Conan of the movies is so radically different from the Conan of the Howard stories that they might as well be two different characters, but never mind that. The scene in the clip above is from the first movie, Conan the Barbarian (1982). It shows how Conan, enslaved as a child after his village was destroyed by the forces of the evil Thulsa Doom, was chained to a mill wheel and grew into a heavily muscled giant after years of pushing the wheel around in circles. This scene always bothered me because it seems unlikely that pushing a wheel around like that would give you the physique of a world-class bodybuilder. It's possible, I guess, at least to a certain extent. This kind of labor would definitely strength your thighs and calves, and I suppose the pushing action would have some effect on your chest, back and other muscles, but would it turn you into The Arnold? Very doubtful. There's also the question of nutrition here. Bodybuilding, even accidental bodybuilding, requires a good diet and I find it hard to believe that the slaves pushing that wheel were fed very well. I'm not sure how old the movie-Conan was supposed to be when he was first chained to the wheel, but he must have spent at least ten years pushing it around and around in all kinds of weather. In the real world I'm guessing all that repetitious slogging would have left him extremely thin, wiry and prematurely aged when they finally released him. And he probably would have had all kinds of knee and back problems. Around the time Conan the Barbarian was made, Arnold Schwarzenegger was 6'2" with a 52" chest, a competition weight around 235 and an off-season weight around 260. (Source: Bodybuilding.com) The guy was flat-out monstrous and even though he had the genetics for size he didn't get that big on a slave's diet. Hard labor can give you mass and make you tough and strong (if it doesn't kill you) but the one thing it doesn't do is give you gigantic, well-defined muscles like a bodybuilder. That kind of physique requires a specific type of training and it's not the same thing as training for strength. There's a big difference between bodybuilders like Arnold, who train for size and definition, and powerlifters, who train for strength. For example, the next video shows the Georgian powerlifter Lasha Talakhaze at the 2017 Weightlifting Championship in Anaheim, California. His build is a long, long way from Arnold's, but it's fairly typical of powerlifters I've seen. Warriors in movies are usually shown as being extremely chiseled, but that kind of physique requires long sessions of targeted exercises in the gym. It's not the kind of body that a Viking farmer, for instance, or a Cimmerian like Conan would develop as a matter of course. In the stories, Howard describes Conan as being huge and muscular with amazing endurance and lightning reflexes. He can also move across a forest floor as "silently as a panther," a talent not usually associated with sheer mass. These qualities -- speed, size, stealth, fast reactions -- aren't usually found together. In and of themselves, they're not totally unrealistic, but even if Conan combined them all in one lethal package, he still wouldn't have looked like Arnold. There's also the question of how good a fighter someone as big and muscular as Arnold would be. If you put a sword in his hand, he could probably do a lot of damage -- for a while -- but he would probably gas out pretty quickly because sustained fighting requires a lot of cardio conditioning and cardio tends to work against the bodybuilder's goal of size. Runners have a completely different kind of physique and a smaller, lighter opponent can usually run circles around a bigger, slower man. For example, the next video shows the notorious MMA fighter, Conor McGregor (around 155 pounds, depending), sparring around with Hafþór Júlíus Björnsson (400+ pounds), the Icelandic strongman who played The Mountain in Game of Thrones. They're just playing around here, but it's obvious that Björnsson could crush McGregor with his bare hands if he ever got hold of him in a real fight. It's also obvious that someone as big as Björnsson doesn't have the cardio to keep the conflict going for very long. If this was a sword fight, the lighter, faster McGregor could probably beat Björnsson if he could just stay out of his reach and wear him down long enough to get in close, something that probably wouldn't take very long. The heavier you are, the slower you are. It's the classic size-and-brute-strength vs speed-and-agility tradeoff. Smaller fighters have an advantage over bigger, heavier opponents if they know how to use it. This is how Bronn won the trial-by-combat against the heavily armored Sir Vardis Egan in Game of Thrones. It's also how the Viper almost beat the Mountain in GOT. Unfortunately for the Viper, he got cocky and that particular fight didn't end so well for him. Getting back to Conan, though, what would someone like him look like in real life? That's hard to say. He would be big, certainly, and muscular, but he wouldn't have the kind of physique that Arnold had in his prime. There were no bodybuilding gyms (or steroids) in the Hyborean Age. Conan was fast as well as strong, so he wouldn't look like Lasha Talakhaze, either. If he did, his stamina and fighting abilities would be limited. A real-life Conan would be big, but not too big, and he would also be lean due to his diet and the generally harsh conditions of his life. He might look something like a extremely fast UFC heavy-weight (206+ pounds) fighter, but considering his speed and agility it seems more probable that he would fit into the light heavy-weight (186-205 pounds) category. In other words, he wouldn't be a giant. All of this, of course, directly contradicts Howard's own descriptions of Conan. For example, in the classic novella Red Nails, Conan is said to be "almost a giant in stature, muscles rippling smoothly under his skin which the sun had burned brown." In Queen of the Black Coast, he's described as a "tall powerfully built figure in a black scale-mail hauberk, burnished greaves and a blue-steel helmet from which jutted bull's horns highly polished." In The Hour of the Dragon, he's a "mailed giant" and so on. He can move over a bed of dead leaves in complete silence and he's always bounding around, as "supple as a panther." In other words, Conan somehow manages to combine the muscularity and size of a heavyweight bodybuilder with the speed, reactions and endurance of a lightweight MMA fighter, not to mention the fact that he's highly intelligent, literate and a wise ruler with a strong sense of honor and chivalry towards the weak. All told, that's a fantastic collection of attributes not normally found in the real world; but he is, after all, a fantasy character, the greatest fantasy character ever created. Scene from The Whole Wide World (2003), based on the life of Robert E. Howard. Video from 2013. I don't know the source. "A wide ranging international study that genetically analysed the DNA of a series of famous and controversial ancient remains across North and South America has discovered that the Spirit Cave remains -- the world's oldest natural mummy - was a Native American. They were also able to dismiss a longstanding theory that a group called Paleoamericans [?] existed in North America before Native Americans." Source: Science Daily. Comment: On the face of it, this story is kind of confusing. According to Wikipedia, "PaleoAmerican" is another term for "Paleoindian" so it's hard to see how this study could have disproved the idea that PaleoAmericans, i.e. Paleoindians, arrived in North America before Native Americans. After all, the Paleoindians are thought to have been early Native Americans. According to one of the researchers, "[the remains found at] Spirit Cave and Lagoa Santa [a site in Brazil] were very controversial because they were identified as so-called 'Paleoamericans' based on craniometry -- it was determined that the shape of their skulls was different to current day Native Americans. Our study proves that Spirit Cave and Lagoa Santa were actually genetically closer to contemporary Native Americans than to any other ancient or contemporary group sequenced to date." In other words, the remains found at Spirit Cave were once thought (by some) to provide evidence that other people were here before the ancestors of the Native Americans, but this DNA study has supposedly disproved that idea. It doesn't prove that the PaleoIndians were here first, though. That kind of certainty is probably impossible since who knows what other remains are lying buried out there somewhere, waiting to be discovered? All this particular DNA study proves, assuming that it's accurate, is that the remains at Spirit Cave are related to modern Native Americans. I'm starting to lose a little faith in these DNA studies since they frequently seem to produce contradictory results. For example, according to a 2016 story in Ancient Origins, "DNA studies indicate that people could not have crossed the Beringia land bridge to enter the Americas 13,000 [?] years ago because the 'entry route was biologically unviable'. Although this finding by geneticists is surprising, it adds even more mystery to the archaeological evidence that anatomically modern humans were in South America tens of thousands of years before Ice Age people could have crossed a viable land bridge between Alaska and Siberia." So which DNA study is accurate? Who knows? If you try researching this stuff in detail, you'll quickly find yourself buried in the technical arcanum of archaeogenetics, an impenetrable swamp complicated by academic squabbles and contemporary identity politics. The prevailing wisdom, which appears to be based on solid evidence, is that the Paleoindians, the ancestors of modern Native Americans, were the first people in the Americas, period, and any evidence which seems to contradict that claim immediately creates a storm of controversy. One interesting detail buried in this story is that "[t]he ground-breaking research also discovered clues of a puzzling Australasian genetic signal in the 10,400 year old Lagoa Santa remains from Brazil revealing a previously unknown group of early South Americans -- but the Australasian link left no genetic trace in North America. It was described by one of the scientists as 'extraordinary evidence of an extraordinary chapter in human history'." This seems to support the theory that some of the earliest, if not the first, people in South America may have crossed the Pacific in boats from Australasia.